Retail therapy at it's finest. Squamish has plenty of retail shops stocking a wide range of goods and gifts for the entire family. All you need is a bag. Escape Route, Valhalla Pure,and Whistler Blackcomb Outlet Store each offer a wide selection of mountain-friendly apparel, ski and snowboard gear, camping goods, technical outerwear and outdoor equipment to help you make the most of your days outside. Squamish Town Hub stocks a wide range of local and artisan-made preserves, chocolates, caramel sauce, salt, soaps, apothecary goods and other culinary treats. You can also stock up on seasonal produce and one-of-a-kind finds at the Squamish Farmers’ Market every Saturday from May through October and biweekly from November through April. The Squamish Store at the Squamish Adventure Centre has a great selection of original artwork, prints pottery, jewelry and other items made by local artists that you won't find elsewhere. 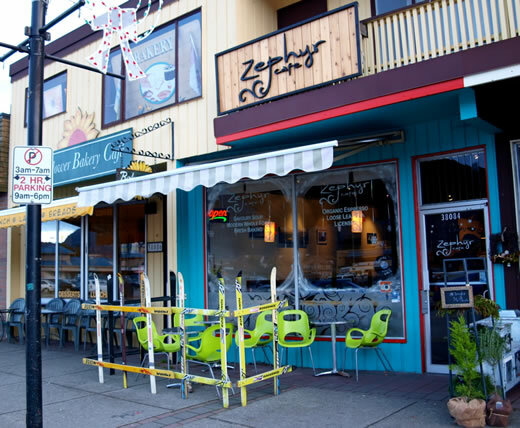 Shop your way through Downtown Squamish and sample the local flavours at one of the area's many restaurants and cafes. Dine, shop and play in Squamish’s vibrant downtown core where you’ll find boutiques, services and amenities all within walkable distance. Tour and taste the flavours of hand-crafted spirits and award-winning ales with expert-led tours & tastings where you'll learn about the story behind your favourite local brews. Home of the world-famous Royal Hudson steam locomotive, the West Coast Railway Heritage Park houses the largest collection of railway rolling stock in Western Canada.